This unique fantasy bag is a really one of the best jewelry pieces we ever made. This small handbag for coins and other small pieces has been designed specially for our “The Alchemist's Daughter” costume and accessories set. Both engineering and design of this bag are simply perfect. Leather is shaped with the help of special matrix and brass is forged as an armour part before etching. Brass accents are etched with alchemistry symbols. Leather edges are reinforced with hand-cutted brass rings from both sides which makes all construction of the bag sturdy and gives it a look of a truly real, serious thing. Clasp is a masterpiece. hello is it possible to have brass alchemistry symbols but with stainless steel accents for the chain and clasp? Hello, unfortunately, it is not possible. 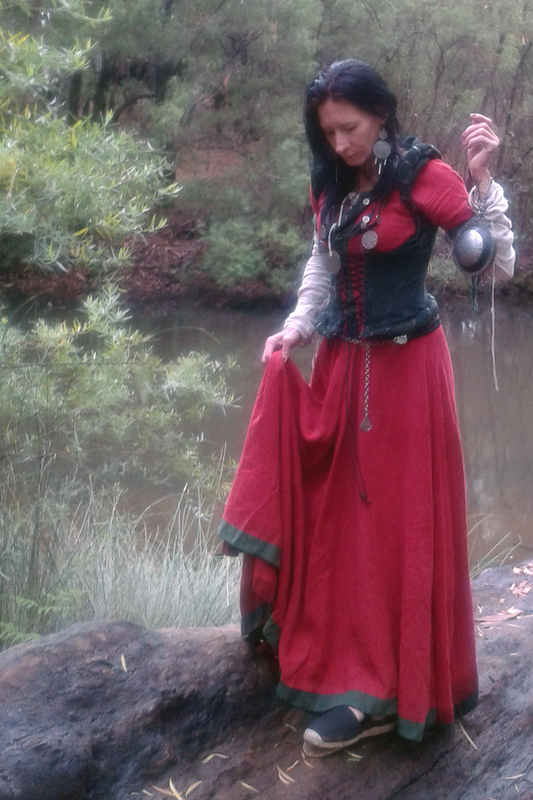 Here is a photo of the Alchemist's Daughter costume with the Spherical bag from our customer Avalyen! Sorry, this bag cannot be made bigger for the technical reasons. Would this bag be shipped to receive by Christmas? The only way to deliver the bag on time is to use an express mail, it takes 4-5 business days and costs $89.00. Please contact us at contact@armstreet.com for more details. Yes, it should be suitable for carrying a portable inhaler and tissues, inner diameter of the bag is 10.5 cm (4''). This is traditional symbolism of alchemy, which appeared in the days of antiquity. There is no mystical sense. Belt is not included, you can order it separately here. Is it possible to purchase just the moldings for the spherical alchemist's daughters bag; because as a leather worker I would like to tool the leather molded domes and side pieces as a special gift. If this is possible what would the price be. Basically it's wearing as a wristlet or as a hip bag, attaching to the belt. The chain is too short to wrap it around the shoulder, it's about 4 in (10 cm). Beautiful as always! You guys are wonderful!